Oh man PK2 was great in my eyes, though the ending came waaay to fast! I adored how more "down to Earth" it was with the personal problems of everyone -- especially the ducklairs since they're celebrities pretty much and so Everett was put on blast in the media. Tempest has lots of potential and I love her too XD She seriously deserves to be seen again. Another character worth revisiting would be Lyo, as well (one of the few merits Pikappa has for me is that it actually allowed for more appearences by Lyo, plus besides being slightly friendlier he didn't changed as dramatically as some other characters. Plus, A Long Farewell). I'm all for the camp that 'The End?' was a giant hate letter to the reboot, since I've heard the writers also hated it as much as the readers. How else do you explain a storyline where the climax doesn't involve not only the universe, but even the TITLE CHARACTER of the series until then? If I still were following the series at that point, I would've felt pretty cheated on by that cop out. I'm not gonna totally regret the reboot, as even that has plenty of stories I really like. Robophobia, I Senzanome, I Cacciatori etc. Another big problem was the lack of new characters to add to the cast. PK2 gave us like 10 new ones that made frequent appearances. There may be some in the reboot, but you can't really care about most of them. The guardians of the galaxy, nope. Those two time cops, forget them! Megawatt? HA HA HA! The only new guy I had any sort of interest in was recurring villain Vulnus Vendor. Um, kay, let's stay more on topic regarding the new series. And with that I'll add that I wouldn't mind seeing them bring in that mad scientist in the new series. Like, don't let the reboot go to complete waste and use some positive elements of it. By the way, with all the time that's passed, and Donald having given up being a superhero, you think there's a chance he dumped Daisy? The fun fact is that Volkin and Roknar (and even the other dozen or so of nondescript Guardians) could've even been interesting characters if they bothered actually try to expand on them (and even then, I actually am probably the only person in the universe that likes Volkin XD I find his design fun to look at in a good way). I'd honestly not dislike to see Vendor in the canon 'verse either. Early Vendor was a pretty interesting fellow before they derailed his character to a more mad scientist vibe, plus, the fact that he was Lyo's very own nemesis helped making him more relevant even while having to share the spotlight as the hero's sidekick with One. I doubt Artibani will be the one to recover him if it will happen, though: he never had any involvement with Pikappa, and he doesn't seem to like the idea of alternate universe series, as he already went on record to say that, for him, PK Universe and the new PK series shouldn't intersect directly least make matters too confusing. Eh, sadly I doubt Daisy can be dumped due to canon status quo (even if they did made them have actual relationship issues and a brief breakup in Ultraheroes... all solved at the end of the story, but still). Though, I think that at least forbids Donald to have proper love interests in the series, and makes the female characters shine accordingly. Which isn't that bad of a side-effect. That definitely didn't stop them from having Juniper declare she loves PK, though. "Potere e potenze" is a very tasty treat so far. Gonna get right on translating when all four parts are released. Screw Pikappa, this will have priority for me now. Also about the retirement, Artibani's idea is that after PK^2, Donald returned to be classic Paperinik, and the agent DoubleDuck, so he stopped dealing with world-shattering crisis and focus on 'smaller' problems. Which honestly don't mesh that well as an idea (I doubt Donald would return to be classic Paperinik at all for one, and if I'm not wrong he did fill with concrete his old, classic Paperinik hideout in one of the earliest issues of PK^2, and while maybe he can coexist with DoubleDuck and I saw it as some sort of spiritual successor of PK, I think it's pretty weird to see Donald be both a superhero and a secret agent. 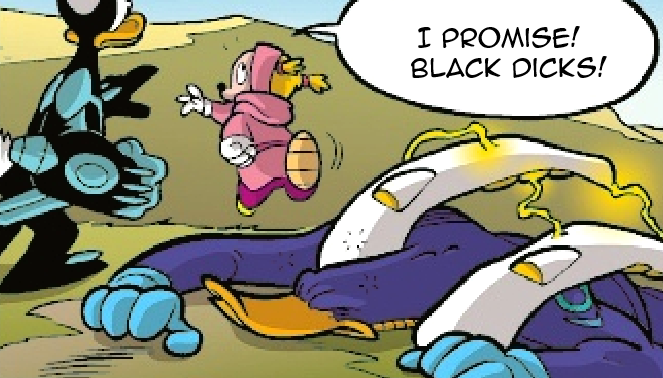 Even if there's Belgravia tying the two continuities together, and Donald did mention to be Paperinik in a DD issue. Plus, a recent 'choose your own adventure' story with Donald had him turn into Paperinik for one branch, and have Kay K get involved in another one... ah, the issues of Disney continuity) but well... it's his vision. Well, let's hope the new PK will get it's own magazine over time. And let's hope that for the destruction of the tower, we'll get a small emotional moment. As excited as I am, I'm going to restrain myself from looking at any spoilers, or even Lyla's translation script. I'll wait for Banker's release. Still haven't read Pikappa. Might never read it, though I've DL'ed all the available issues. As for the original PKNA and PK2, both of them are great in their own way. I personally slightly prefer the original series, its lighter mood and humour, over PK2. I felt like PK2 lost some of the unique charm and masterful style from the first series, and while it does some things better, I just didn't enjoy it quite as much. Yeah, I can see how PK^2 is pretty divisive. I still say, liking PK^2 is a bit of an acquired taste and accepting the changes, while you can like PKNA more easily by comparison. Wasn't this a poll to decide whether PK activates the self-destruct mechanism, not over whether Ducklair Tower gets blown up or not? PK may decide to blow up the Ducklair Tower, but it still does not blow up (maybe One returns to stop that?) or he decides to not blow up the tower, but it blows up because of different reasons anyway? They seemed literal about the destruction of the tower being the buttonpress. Also, scans for the third part are not up yet, but we already have a spoiler image for the fourth one. This should ease some worries. Saving the classic, Extransformer-wielding PK for the last episode was a wise move in my opinion. I waited so much for this XD And I assume in-story Donald has finally found the resolve to 'officially' return wholly as PK. Can't wait to read episode 3 tomorrow. Now let's wait and see what will bring down the Tower, and how... if it's not the buttonpress, of course. Oh wow the spoilers. Holy holy holy. Ah, how cute, they even have their own names. Read the issue. Oh boy, things are getting heated up for the climax. Can't wait to get to read all of this, I'm trying to keep myself somewhat spoiler free, especially how things seem to really start to heat up. And yes, I wasn't expecting them to do an actual destruction of the actual tower, let alone the option actually winning. But it should be for the better, this series should just not be all going back to the same status quo but be evolving as PKNA always have been. However, as much of a publicity stunt the poll might have been, it's really a thing you shouldn't do since I feel it takes away parts of the integrity on the part of the authors. Do your *own* story and not what the popular vote mandates. Especially if you're just gonna goad people into voting on whatever you want to do yourself in the end anyways. The way I see it, it was probably someone else's idea that they should prepare two different scenarios and ask the readers which they would prefer. This writer guy had his own opinion of how the story should progress, and he made it clear. That's how it looks to me, not a conscious strategy but a conflict of opinions within the production team. Not sure whether that is good or bad, but I'll trust the writer guy to know what he's doing with the story, particularly since he got what he wanted. Most likely, the authors were unsure if destroy or not the tower and thought of asking the readers. the old PKNA was very interactive, after all. That's another option. They wanted to destroy the tower, but were unsure if such a radical departure from the status quo would create a powerful counter-reaction from the fanbase. But here's a bunch of spoilers for the fourth part that will make you crap your undies. ... so here's how things would look if I let Google Translate do all the work and I didn't use my brain. I had to stop there for a minute to collect my thoughts before I went to research words. ... just letting people know I'm in the translation process. Glad to hear you're already at it. I'm practically drooling here (along with many of other international fans).